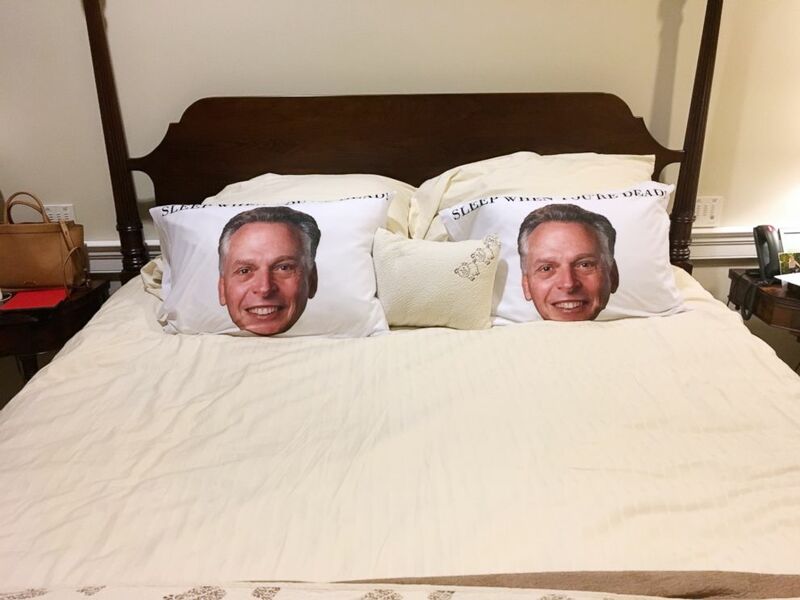 This image provided by the office of Governor of Virginia shows a photo of two pillowcases with a portrait of former gov. Terry McAuliffe on the bed at the Governor's mansion at the Capitol in Richmond, Va., Dec. 13, 2018. Outgoing Virginia governor Terry McAuliffe followed a longstanding state tradition of pranking successors by leaving a special gift for the newly minted Democratic Gov. Ralph Northam: a pillow set plastered with McAuliffe's grinning face. McAuliffe left the pillows engraved with the phrase: "Sleep when you're dead." "When Gov. McAuliffe said he expected I’d lose some sleep over the next four years, I didn’t know he meant starting on night one," Northam said in a statement to ABC News. "Now, he’ll never be too far from my mind," he added. Northam was elected the next governor of Virginia on Nov. 7 after overwhelmingly defeating Republican Ed Gillespie. Beginning the "peaceful transition of power" in the commonwealth, Northam delivered his inaugural address on Saturday. While delivering his inaugural address, the new governor expressed his goal of leading the state "with humility and optimism, telling the truth, learning from history and removing every obstacle to progress for all Virginians." Gov. 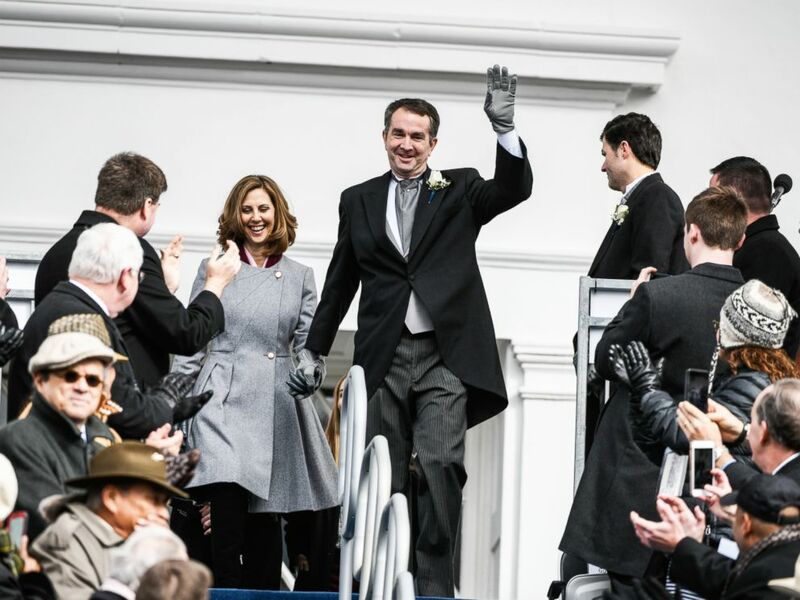 Elect Ralph Northam and his wife, Pam Northam make their way to the inaugural platform before taking the oath of the office on Jan. 13, 2018, at the Virginia State Capitol in Richmond, VA.
Northam arrived at the governor's mansion after taking the oath of office to find the surprise from McAuliffe. Virginia has a long history of practical jokes between governors. Former Gov. Robert McDonnell set an alarm clock to disturb McAuliffe's first night in the governor's mansion. But the surprises didn't end there for McAuliffe. He arrived at his new office to find a stuffed taxidermied bear in the private bathroom. When McDonnell entered his tenure as governor, now-Sen. Tim Kaine placed cellphones in the elevator shaft of the governor's mansion and often called them until McDonnell's staff found them and removed the phones. Now-Sen. Mark Warner gifted Kaine with a life-size cutout of himself in the executive mansion's shower.